If you have not participated in this program before and think that your lake is experiencing an algae bloom, please refer to the automated sample number generator below. The Dept of Ecology will approve testing of the sample after submittal. If the sample is not approved, we will contact you to let you know. Directions can be found here about how to collect the sample and how to send or deliver it to the laboratory. It is very important for you to carefully follow the directions. When collecting the sample, be sure to fill out the data sheet and send it along with your sample to the King County Environmental Lab. To start the sampling process please use the automated sample number generator and follow the instructions. 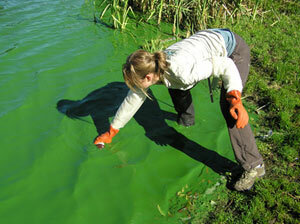 Once a sample is at the laboratory, specialists will identify the algae species. If the sample contains an algae known to produce toxins, the laboratory will run a toxin analysis on the sample and you may be asked to send in more samples. Be aware that Ecology cannot reimburse postage or delivery costs but does pay for laboratory analyses. If you are submitting a follow-up sample for a lake that has already been tested in previous week(s), please follow the directions above. Please sample only one week after the toxin levels return below recreational levels. Samples will be approved by Ecology before testing. Please work through Ecology. 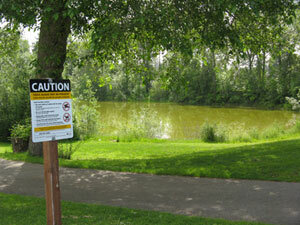 The laboratory will not accept outside samples through the Ecology program unless they have been approved by Ecology.